I am a big believer in trying to see challenges and situations from as many points of view as possible. It is so easy, when involved in situations, to be so preoccupied by our own agenda, that we miss the bigger picture, maybe even the truth of what is really happening. Now this principle of trying to get a 360° view of things doesn’t have to apply only to emotional challenges, it can apply to any challenge. So today, in order to take a different look at the challenge I set myself yesterday, I decided to ride roughly the same route, but in the opposite direction. Despite having my legs reminding me that they had undertaken a tough test yesterday, I set off towards Upton and Lychett Minster in the mid afternoon. The sun was warm and the breeze had a welcome cooling effect as I started the slow rise along Grange Road. It’s a beautiful route, farms and woodland line either side of the road. You pass under a railway bridge, which is the continuation of the Swanage Steam Preservation Society line, though the trains don’t come this far at present. 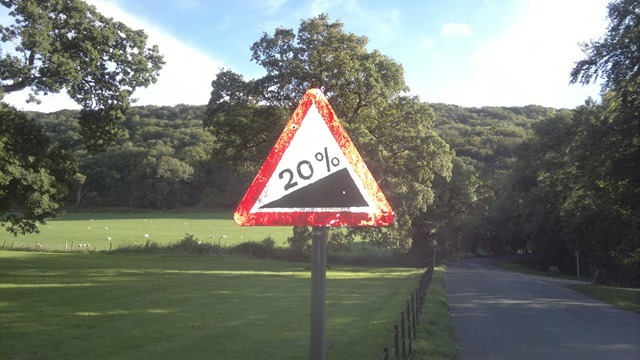 As I reached Creech Grange, the dreaded 20% incline sign loomed into sight and I knew that the challenge of Creech Hill was just around the corner. Yesterday, travelling in the opposite direction, I had reached a speed of just over 60kph, so maybe that gives a better indication of just how steep the hill becomes. Anyway, I had set the challenge, the main focus of the challenge was upon me, and I was ready to confront it head on. Most roads, even little B roads like this, don’t usually go from being flat to being steep in one step, usually there is a gradual increase in the incline, but not this one. Within a few metres I was clicking through my gears, trying to maintain what little momentum I still had, and resisting the temptation to stand on the pedals. Generally speaking, if you remain seated, you get better traction through the back wheel and you don’t have to support your own weight, saving your energy for turning the pedals. As happened yesterday, a couple of cyclists came past in the opposite direction, shouting encouragement as they went. Metre by metre, step by step, I climbed the hill. Although the ascent is very similar to that from the other side, this is much steeper. Happily, because it is steeper, it is a great deal shorter, so the summit was reached quite quickly. My heart rate monitor was testament to effort expended, but as the road levelled out, and the amazing views either side revealed themselves, my beats per minute quickly dropped, as did my breathing. The challenge had again been conquered. The rest of the trip was made in the company of a couple of guys on road bikes, and cycling in company always makes the kilometres fly by. I was home well before the sun had even thought about setting. My idea to examine my challenge from a different viewpoint was, I feel, very worthwhile. Not only did I get a better impression of the effort involved, but I saw the views along the route from a different, and in some ways, better aspect. This works for any situation we might find confronting us. More information is always preferable as we search for a solution and seeing things from a number of points of view gives us a better and more rounded understanding of how things really are.